The latest of our proofreading projects to be completed is With the Ulster Division in France, a narrative of the first World War from the perspective of an Irish soldier. While many war narratives follow a certain arc — from training and routine, to struggle and loss of innocence, to eventual survival and a return home — this one is a bit different. 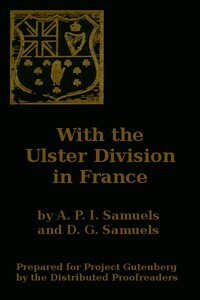 Constructed from the diaries of a soldier who did not survive the war and whose division suffered substantial losses, it starts in the traditional mode, with some engaging prose about travel through France and the eventual experience of trench warfare, but then it is cut short, the story replaced by a long series of formal statements honoring the sacrifice of countless Ulster Division soldiers to German machine guns. The result is a narrative that, while inherently unsatisfying as a story, effectively conveys the tragedy of the conflict through its own incompleteness. If you care to experience this sobering book for yourself, it can now be read online or downloaded in a variety of popular eBook formats through Project Gutenberg.